We kick things off with audio from the new film This Living Salish Sea which premieres Nov 23 (see below). Then we go to Alberta’s own dirty oil propagandists at Rebel Media, and the Alberta NDP government are both promote climate destruction policies. Rachel Notley is soon coming to Vancouver to lecture on why municipalities shouldnt protect their citizen’s interests when it comes to tarsands. International big banks are ramping up Alberta oil sands projects even though scientists warn it could spell “game over” for human civilization. Rainforest Action Network is challenging JP Morgan’s financing tarsands with public actions against them. Watch the whole conversation here. Kanahus talks about the divestment front having recently travelled to Europe. 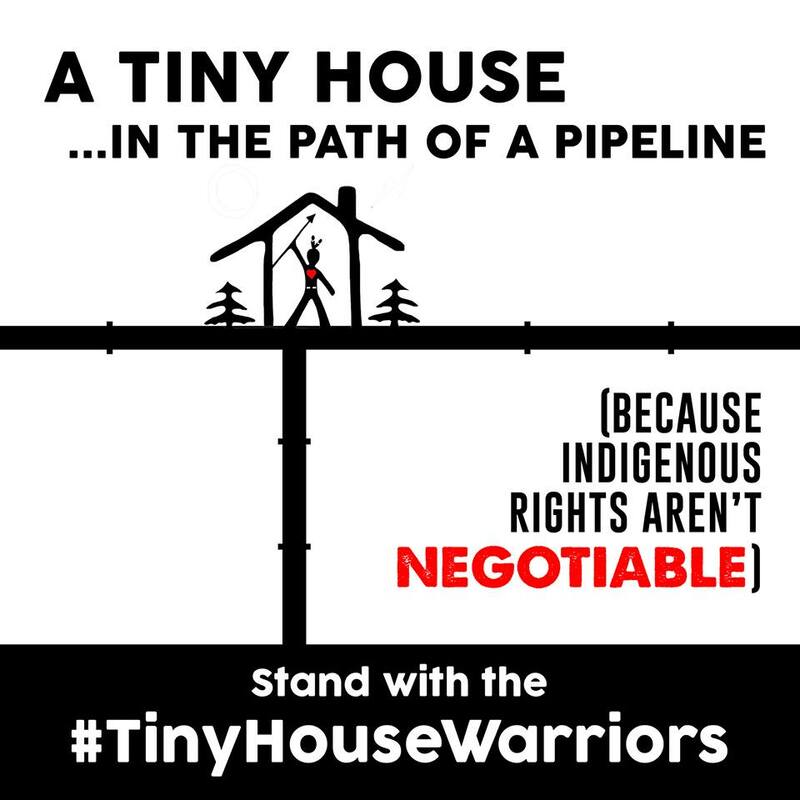 Kanahus also talks with us about the #TinyHouseWarriors program which is expanding and inviting assistance of funds and people power. Check out their website. Melina Laboucan Massimo also was helping recently with the installation of a solar panel for one of the tiny houses. Plus she recounts how Wild Salmon Warriors returned home recently after conducting a two week observation and removal of Kinder Morgan’s anti-salmon spawning mats that illegally disrupted four water ways in Secwepemc Territory. The mats were installed without any knowledge or consent of the Nation, just as the Kinder Morgan pipeline is continuing without the free, prior and informed consent of the Nation as well. Upon learning the exact locations of 4 of the supposed 7 installation sites, Wild Salmon Warriors, on the authority of the Secwepemc Nation, have removed all such mats in the area. 28:00 Interview with Eugene Kung, West Coast Environmental Law. Legal Fights with the regulatory process are in full swing, with the Squamish Nation this week at BC Supreme Court to argue that they were not adequately consulted on BC’s decision to green-light the pipeline. Eugene shares his assessment of current legal fights. Artist and film maker Sarama uses his lens and his writing, the voices of the people, and the power of nature’s beauty, to tell the story of why we must work for positive change, to ensure the survival of humanity and life as we know it on this living earth. Nov 18 is the Kelowna premiere screening (LINK here). 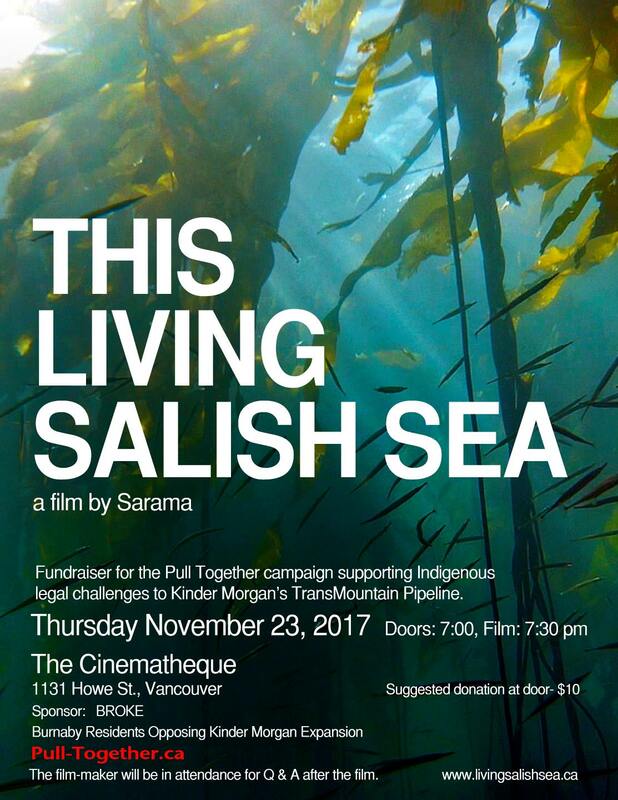 Nov 23 is the Vancouver premiere of his important film, This Living Salish Sea, and will help raise money for Pull Together, funding First Nations legal challenges to Kinder Morgan – see the trailer here. Extensive underwater cinematography shows the life and beauty of the Salish Sea. In addition, local communities stand along with First nations to protect this environment with compelling civil disobedience and challenges to inappropriate industrial development. Talks with scientists and First Nations, along with detailed research, reveal impacts to local ecosystems, climate change and ocean acidification. The arrests on Burnaby Mountain of people resisting Kinder Morgan’s TransMountain pipeline expansion foreshadow things to come. Vancouver screening event RSVP. 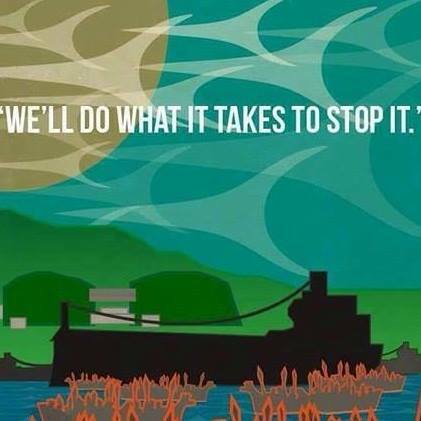 Stand With Kwantlen is a community of Kwantlen people, Indigenous folks from all over, and settlers, working together to manifest the possibility of unceded Indigenous land without the Kinder Morgan pipeline. The Kwantlen Nation is building a healing lodge on the proposed path of the Kinder Morgan pipeline on their territory, and planning a more comphrehensive project which would start construction in the Spring. Background info here. Link to our Eyes On Kinder-Morgan webpage. Want some more skills when confronting Kinder Morgan? Here are some upcoming training sessions to help you out. The links with full information are below, and you can also contact Mlovell@greenpeace.org for more information. Learn how to be eyes on the ground to stop Kinder Morgan pipeline expansion construction with their new video. NEXT WEEK: We examine men’s accountability and ending violence against women.